I was happy to be invited to open an exhibition of etchings by talented emerging artist Rachael Ness, at the Firestation Print Studio on Thursday 5th of September…. here are some images from the show and my intro talk. 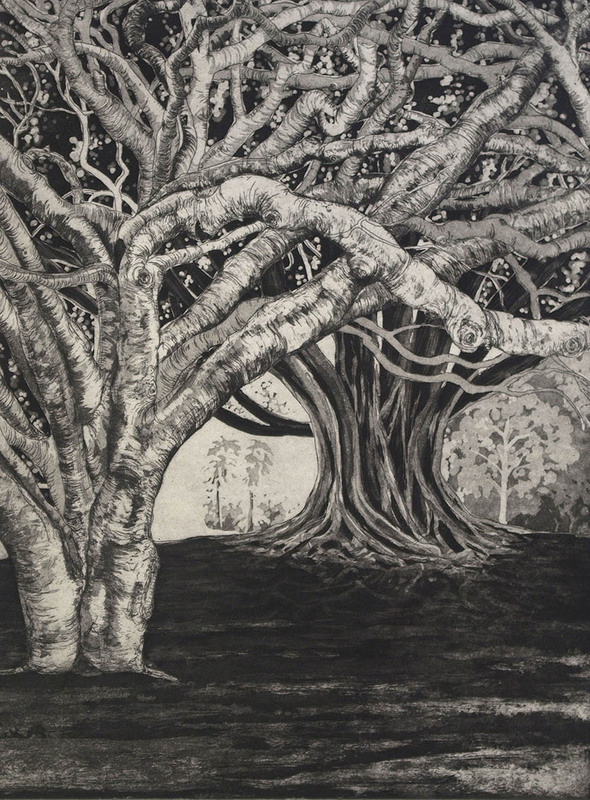 In this exhibition Rachael Ness has created an impressive set of large format etchings and monotypes that explore the unique shapes and different forms of trees. Rachael completed her studies in Painting and Printmaking in 2011, and since then her love of print has clearly emerged as the driving force behind her creative practice. As an emerging artist her work displays a fantastic sense of exploration and experimentation. 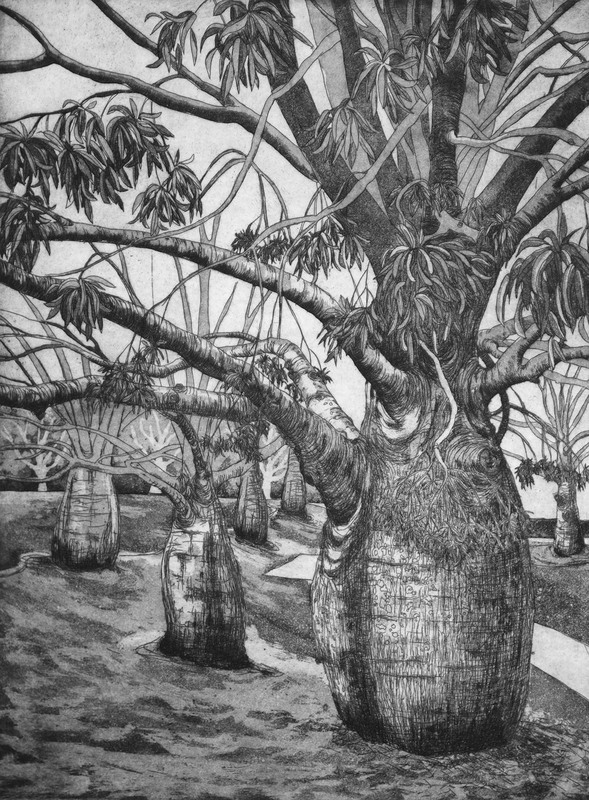 In the relatively short time I have known Rachael of about a year, I have seen her work oscillate between fantastic imagery of half cow/half fish creatures, to the façade of San Marco in Venice, sea urchins, giant detailed linocuts of Lily heads, and now this latest series of etchings which are all about trees. 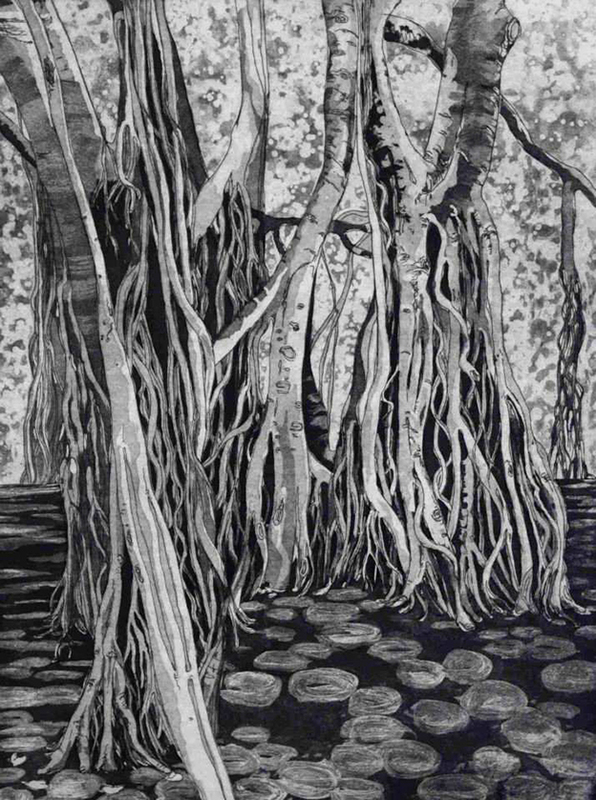 The trees that Rachael has chosen to focus on are particularly generous and abundant, both in their massive size, and the manner in which the artist has attentively described them. There is also a terrific variety of trees on display which relate to the artist’s globe-trotting habits, as she translates strong visual impressions gained over years spent travelling and living in different parts of the world. From sprawling Pines, to the beautiful buttress roots of Morton Bay figs, the bulbous Boab trees from QLD, to a single towering Boabab tree cited in South Africa. The show also encompasses trees found much closer to home. 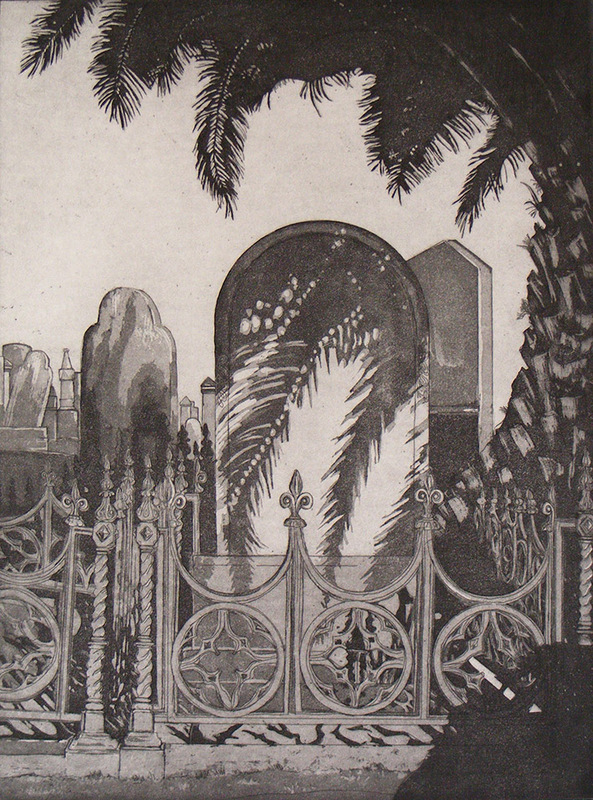 The evocatively titled print Resting in their shade, contains a palm tree that casts its shade over tombstones in a cemetery nearby in Caulfield. Whereas in the print Hard Rubbish a suburban street of Melbourne complete with picket fence, a massive Liquid Amber tree and pile of wooden refuse shows us three very contrasting depictions of wood, from the living tree, to the man-made fence, and subsequently discarded planks that wind up on the nature strip. Rachael clearly has a keen eye for observation as she records and describes the world around her, yet while she adamantly says she is not a story teller, these etchings contain a metaphoric resonance that take them beyond the realm of pure observation. Here the vast forms of trees appear like ancient sentinels, who stand around us and bear silent witness to generations of human activity that unfolds beneath them, in their shade. They each have a particular identity formed over years of slow growth, which Rachael finely delineates through twisted tangled branches, and sprawling boughs. With botanical accuracy Rachael has described every nook and cranny that create these breathing organisms. The level of detail is impressive, as is her use of different etching processes in combination to create varying grades of tone to capture dappled light, deep shadows, and in some works such as Creeping Shade, highly atmospheric background effects. The fact that they are largely monochrome allows for the lines and textures she harnesses to take centre stage. This show displays a reverence for our often overlooked leafy companions, who provide us with shade, oxygen, and most importantly are a constant reminder that we all occupy in a living breathing planet. 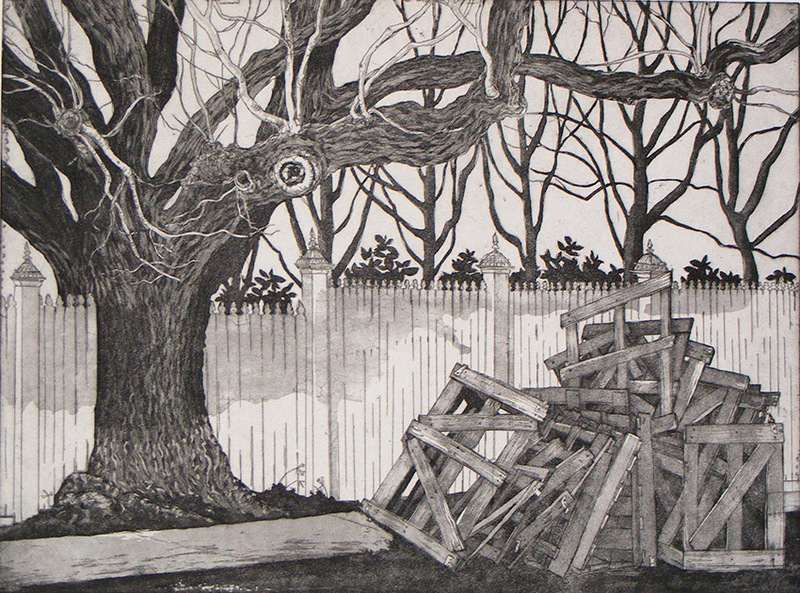 Tags: art, contemporary art, Emerging Artist, etching, Firestation Print Studio, Print, printmaking, Rachael Ness, Trees. Bookmark the permalink. I enjoyed this essay which really does help one get into the art, which, on the face of it might seem like just so much dutiful copying. However, understanding that they are prints and taking the time to look carefully at them reveals that they are much more, nuanced and complex. My favorite piece here is “Hard Rubbish”, and your description of the different stages of wood gives a nice angle into the image. It’s also good to know she has done things as varied as half fish/cow creatures. I look forward to seeing more from this artist and others on your blog! An excellent analysis. As a first year art student with Dyslexia, I really struggle with this aspect of my course. Thank you for this excellent example of how to report on an exhibition visit. And thank you also for introducing me to Australian printmakers. No problem, glad u enjoyed it and got something out of it. My partner is an artist with dyslexia also, I think it is often associated with creativity which is a positive. Good luck with your studies and keep printing / blogging , looks great!